Teams included: Brackenridge, Burbank, Edison, Harlandale, Holy Cross, Jefferson, Sam Houston, South San, Young Women’s Leadership Academy. Holy Cross’ volleyball team has relied on its senior leadership this season, but the Knights discovered Friday that – even without two of their key veterans – the same foundation for success is in place. The Knights (19-5, 1-0) defeated a tough South San team 25-23, 25-22, 25-19 last Friday in a non-district match at Holy Cross. They played without seniors Julia Ibarra at setter and Mallory Ozuna at outside hitter, but still notched their third victory of the week. “I think what we got out of it was that it was a pretty defining match for our season,” third-year Holy Cross coach Ruben Calderon said. “To play without Julia, who’s injured right now, and Mallory, it was a good reflection on us. Victoria Gonzalez and Henrianna Ibarra each finished with eight kills for the Knights. Ibarra also made 14 digs. Setter Stella Ramirez dealt 26 assists. Anna Zuniga collected two blocks. For the Bobcats (10-7), Brittany Martinez and Rebekah Rodriguez each contributed eight kills. Rodriguez also served two aces, as did Erica Jimenez and Giselle Mata. Senior Kim Tobias made 15 digs and Jaclyn Ozuna distributed 12 assists. Kaitlyn Serna chipped in with two blocks. Holy Cross freshman Daisy Flores served eight aces against South San, displaying the aggressive serving Calderon has set as a point of emphasis for the team. Last Thursday, in a 25-19, 23-25, 25-10, 25-10 TAPPS District 3-4A win over San Antonio Christian, Mallory Ozuna served a mind-boggling 22 aces to go with 13 kills and 15 digs. The 5-foot-4 outside hitter-setter has recorded more than 100 aces this year. 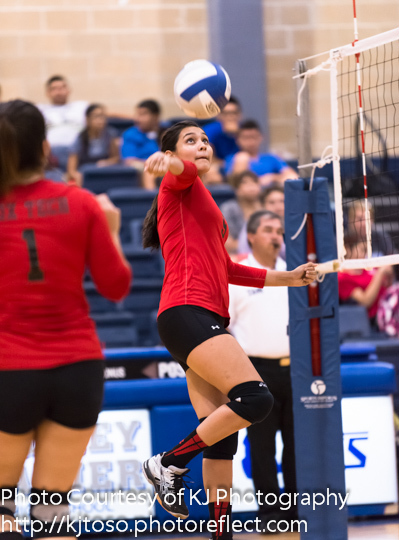 Third-year starter Julia Ibarra had an outstanding first district match with 38 assists. Outside hitter Ariel Alvarado also is a senior starter. “Julia has confidence and experience, knowing the system,” Calderon said. “Our senior class is a huge reason we’re doing so well. They have a strong commitment to the team and where we want to go. Mallory has previous (state) championship experience under her belt. That’s been a huge asset. The Knights stomped Hawkins 25-9, 25-10, 25-6 Sept. 3 at Holy Cross. Ramirez supplied 15 assists and nine aces. Gonzalez also served nine aces and added six digs. Ozuna also collected six digs. Megan Hernandez made two blocks. South San recorded a 25-19, 25-19, 25-17 win over Southside (4-14) Tuesday behind 15 assists from Jimenez and nine kills from Angel Salazar at South San. 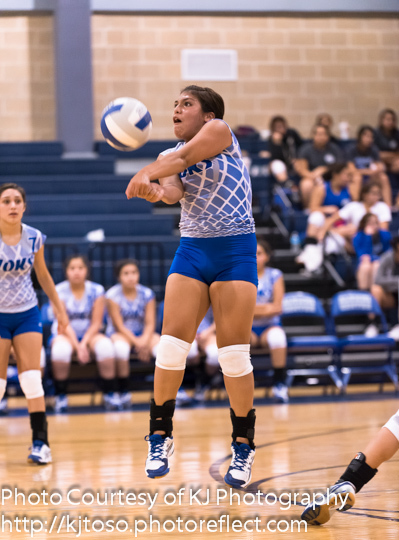 The Bobcats had defeated Holy Cross Aug. 24 to place third in the South San Tournament. Calderon said the Knights began working toward this season after losing their final match in 2012. “They were disappointed with their last district match,” he said. “We knew what we had coming back, even though we’re still young. We have two freshmen in the rotation and two sophomores starting. We had a pretty good offseason and our summer league was pretty good as well. Holy Cross hopes to battle for first in a highly competitive District 3-4A. “I think we have a pretty fair chance at making a run,” Calderon said. “Victoria St. Joseph is the team to beat. They made it to the state championship last year. Right now, I think they’re 22-4, if I’m not mistaken. Harlandale (13-7) claimed two victories last week, defeating Brackenridge 27-25, 25-18, 25-18 last Friday and blasting Wagner (12-10) 26-24, 25-17, 25-19 Sept. 3 to continue the momentum they gained two weeks ago at the SAISD Tournament over the weekend. The Indians, who finished second in the tournament, extended their winning streak to three matchs by defeating Brackenridge in the non-district contest at Harlandale. Senior Katie Neira led her team to victory with 12 kills, seven digs and four assists. Sabrina Esparza contirbuted 13 digs and eight kills. Catherine Silva had 14 assists and eight digs. Alicia Garcia added 13 assists and five digs. Sierra Sandoval made 11 digs, after contributing 16 against Wagner. Brackenridge was led by 19 assists from Renee Osife, 17 digs from Kathy Sifuentes and nine kills from Darlene Jackson. Harlandale defeated Wagner for the second time in three days. Senior Cera Cerda led the Indians with 15 kills. Freshman Kianna Sandoval contributed 8 assists and eight digs. Madeline Mendez made five kills. Erika Arredondo led the Indians with three blocks. Jefferson (14-6, 2-0) remained undefeated in District 28-4A last week with a 24-26, 25-20, 25-18, 25-21 win over a very determined Burbank team (5-14, 0-3). Sam Houston also pulled together for an impressive 25-18, 25-12, 25-16 win over tough SAISD rival Sam Houston (14-8) Sept. 3. Against Burbank, Jefferson senior Gabby Vasquez authored 22 digs, 17 kills and five aces. Courtney Garcia distributed 17 assists. Defensively, Melanie Sheppard stood out with five blocks. The Bulldogs were led by 14 kills and four digs from Jenna Villanueva. Leticia Gomez had 20 assists. Audrianna Martinez collected 28 digs and served two aces. Vasquez turned in another outstanding match for Jefferson versus Sam Houston with 11 kills and 18 digs. Marissa Vargas made five blocks. Selena Garcia had 11 assists and served two aces. Dionna Camino made 11 digs for Sam Houston. Tiaria Mackey smacked six kills. Rita Davis distributed seven assists. Tashonna Williams finished with two blocks and two aces. Tia Logan also made two blocks. Edison (6-18, 2-0) kept pace with Jefferson in 28-4A with a 25-17, 25-11, 25-13 home win over Young Women’s Leadership Academy (2-19, 0-3) last Friday. The Golden Bears received 11 kills from Karen Guerrero and 19 assists from Marissa Cortinas. Juanita Gomez made eight digs. For YWLA, Karease Williams had team highs of seven assists and two aces. Tatianna Sorwell put down five kills. Edison edged Brackenridge Sept. 3 in its district opener 25-21, 20-25, 25-21, 25-19 at Edison. Guerrero made 22 digs and blasted 12 kills for the Golden Bears. Cortinas had 14 assists and Gomez finished with 13 digs. For the Eagles, Osife was credited with 20 assists, eight digs and five kills. Jolicia Shelton-Brown had a match-best 13 kills and made seven digs. Sifuentes finished with 19 digs. entirely, however this piece of writing gives nice understanding even.